A giant banner covers the front of the Foxwoods Theater on 42nd street in New York. Spider-Man's web has gotten tangled on Broadway. Several delays and at least two actors who were left helplessly dangling from cables high in the air marred the first preview of the mega-musical "Spider-Man: Turn Off the Dark." According to published reports, Sunday night's performance of the reported $65 million show ran over three hours because flying tricks went wrong and the production had to stop at least five times. Actress Natalie Mendoza, who plays an evil spider, and Reeve Carney, who portrays the comic-book hero, were stuck suspended over the crowd at different times, according to audience members. Even so, The New York Times wrote that most of the show's stunts "went off without a hitch, with children and some adults squealing in delight." But the New York Post called the show an "epic flop as the $65 million show's high-tech gadgetry went completely awry amid a dull score and baffling script." The show did manage to chip away at its massive costs, however, by finally opening its doors to the public. The Broadway League said that single performance grossed $200,605 from a sold-out crowd of 1,928. The average ticket price was $117.52. The show is the brainchild of Tony Award-winning director Julie Taymor and U2's Bono and The Edge, who wrote the music. More than eight years in the making, delays and injuries have plagued the show's debut. Producers did not immediately return calls for comment Monday. For Peter Filichia, a theater critic for The Star Ledger in Newark, N.J., the long delays getting the project to the stage and the problems now that it is finally being performed bode poorly. "This show essentially has two strikes against it to begin with," said Filichia, who, like other critics, will wait to see the show once it is ready for review. "We've seen a lot of hitters hit home runs after having two strikes on them, so it could happen here as well. But, gee, I see a fast ball coming right down the middle." There is plenty of time to try to fix the show. 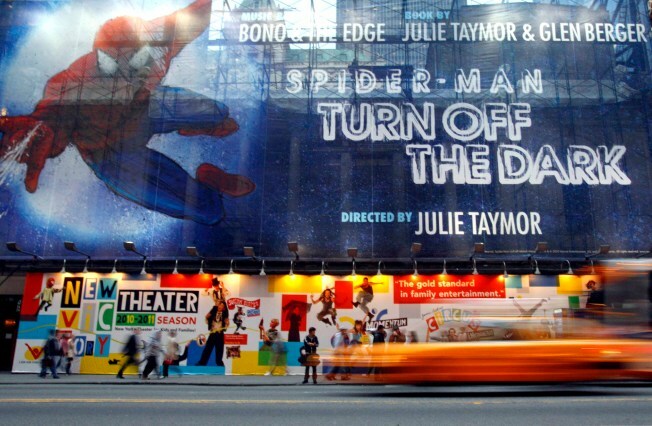 "Spider-Man: Turn Off the Dark" will open Jan. 11, meaning producers have more than a month of previews. Other Broadway shows have struggled with getting their sets and stunts to work during previews, including "Mary Poppins" in 2006 when the massive house set went off track and "Titanic," which was plagued by numerous technical problems during its monthlong preview period in 1997. Both went on to be hits. The Spider-Man show promises to be a spectacular event — if it gets the kinks worked out. It will have a 41-member cast, 18 orchestra members and aerial stunts designed by a longtime Cirque du Soleil alum that shoots actors up to 40 mph through the air and over the audience. Its promotional material promises "a thrilling experience in ways never-before-dreamed-possible in live theater." Besides timing troubles, two on-set accidents injured actors during rehearsals, including one who had both his wrists broken when he practiced an aerial stunt. Inspectors from the New York State Department of Labor, which must approve all stunts that go over an audience, signed off on the show only last week. Meanwhile, the bills keep piling up. "This seems to be a strange kind of hubris that's going on here: They cannot admit that they were on the wrong track. To me, it seems as if they've been throwing a lot of bad money after good money," said Filichia, who has charted other theatrical embarrassments in his book "Broadway Musicals: The Biggest Hit and the Biggest Flop of the Season — 1959 to 2009." "I can't say that this strikes me as something that was wise, but history is littered with fools who just had to continue even when they knew that they were doomed, hoping that as long as they were in the race some miracle could happen that could save them. And who knows? There may be a miracle that does save them," he said. Until now, "Shrek the Musical," which opened in 2008, is believed to be Broadway's costliest show with a price tag reported to have been $25 million, and it failed to make its investors money.